I didn’t start out as a fan of granola. There’s something about the flavor of the sort you get in the box that never sat well with me, and after that wayward Summer we spent with the cousins when the aunt decided that orange juice was a suitable wetting agent for cereal, namely granola, the fate of the oated pariah was sealed for me. I guess time softened the memory because I made a batch a few years back when my oatmeal-for-breakfast experiment didn’t go over so well, and I was staring at a Costco sized cylinder of the stuff that needed to be disposed of. Somewhat morally opposed to tossing perfectly good (in a manner of speaking) food (years of Catholic education and Lenten sermonizing will do that to a person), I was contemplating oatmeal cookies (also not a fan … so sue me) when there on the Food Network I saw Alton Brown making granola and it looked really, really good. Chalk it up to being unknowingly pregnant at the time with the last of my little miracles, I was in the kitchen lickety split to make my first batch. I’ve been making it now for nine years (my original printout of the recipe, marked up and splattered is dated 5 Jan 2005 … how time flies) and I haven’t followed the original recipe for some time, tweaking to suit tastes and/or supply on hand. Also, I do not ever, nor wiIl I ever, add raisins. There are few fruits and veggies I dislike but grapes are one of them and their dehydrated brethren are even worse. I do, however, have a soft spot for the fermented variety. Go figure. In any case we’ve settled on dried cranberries as the chewy tart element to balance out the crunch, sweet, and surprisingly tasty salt components. I still can’t eat the stuff wet. 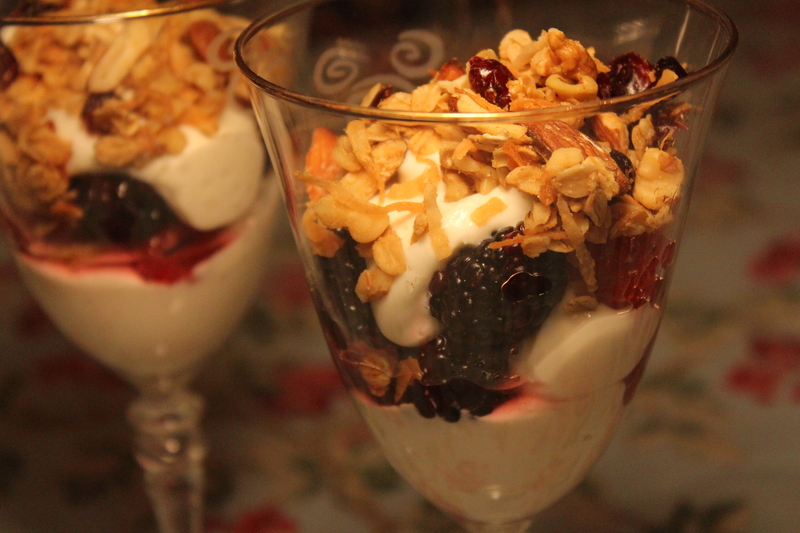 But for my folks, I make yogurt parfaits which they can eat obscene amounts of. I use organic vanilla yogurt from our local market because it has the best flavor and doesn’t have that disconcertingly gelatinous mouth-feel that I find in most mass-produced yogurts, even the currently trendy greek-style. Not to be a hater but please do give the organic small batch sort a taste; it’s no more expensive than the greek-style. And one final note on yogurt from my over-the-shoulder editor, Aiden says it tastes best with lemon yogurt. He’s a wild man. Put the oats and nuts into the bowl. I’ve rough chopped the nuts so that a mouthful of the granola has a bit of everything but not so small that you can’t tell what you’re eating. If you prefer another sort of nut, feel free to change things up. Please note how carefully I measure. This recipe is not a clumpy granola so the more the merrier. If you want a slightly less sweet granola, I sometimes use the large cut unsweetened coconut flakes; it’s a nice change of pace. I use what I’ve got on hand. And other than that one ill-fated garlic granola, it’s all been good. I kid. I kid. Just seeing if you’re paying attention. 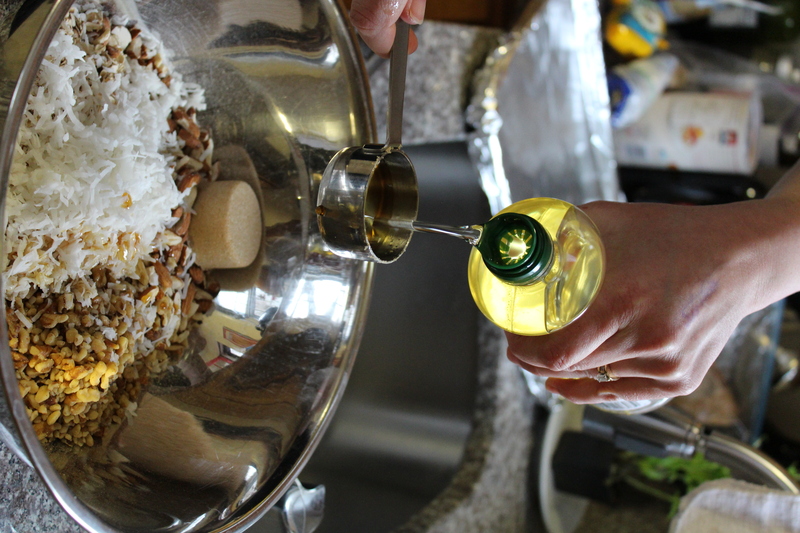 Add the brown sugar (that thing in the back of the bowl that looks like a spray can lid … to me anyway), the maple syrup and the canola oil. A note about maple syrup: Only use real and Grade B has the best flavor. That stuff in the little lady bottle or simply called syrup is corn syrup, artificial flavor, and petroleum-based artificial color. Not that I’m being judgy but that stuff is an offense to all things called food. Stir everything together and pour onto the baking sheet, spreading in an even layer. Bake at 250 degrees F for 1 hour 15 minutes, stirring every fifteen … or thirty… or 45 minutes. Or be smart and set the timer to remind you. No harm done but you’ll get a more even toasting if you stir with some frequency and regularity. When it’s toasty delicious and your house smells terrific, take it out of the oven and put into the cleaned bowl to cool. 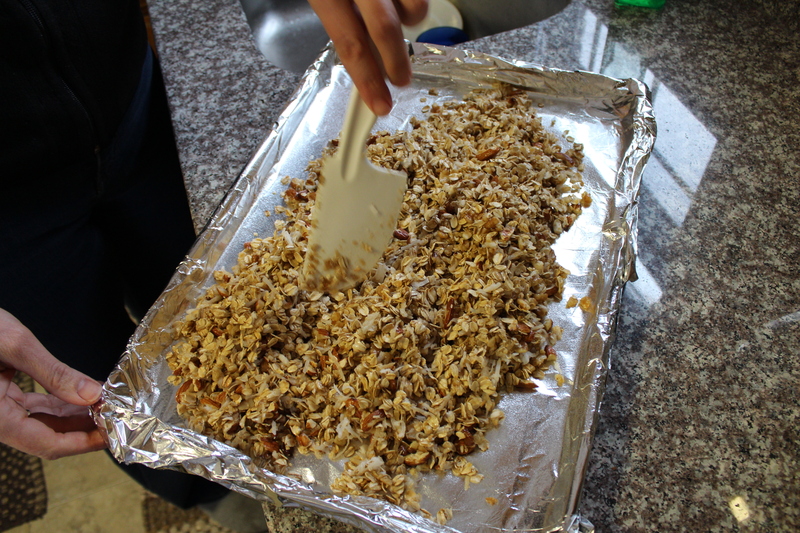 Once cooled, add the dried cranberries and stir to incorporate. It’s now ready to eat. 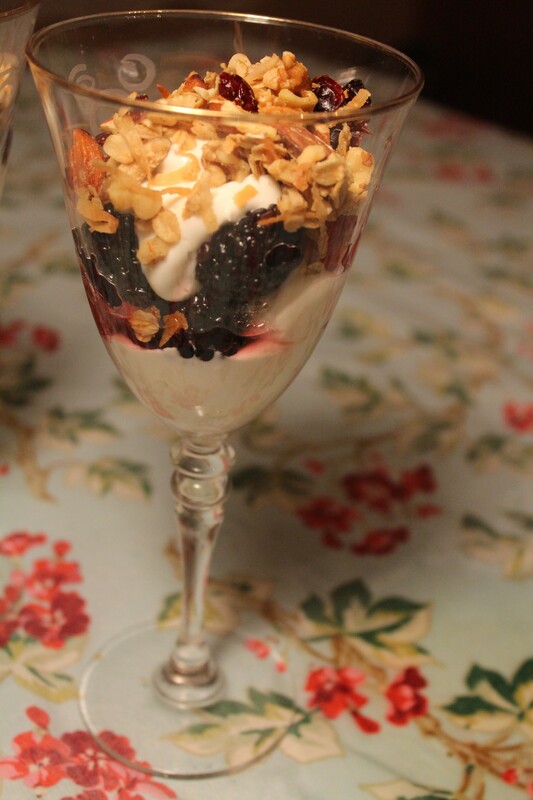 Bonus footage … the parfait! It’s February so even the fresh fruit needs some assistance after its bazillion mile journey from whatever part of the other hemisphere it came from … or, in this case, whichever hydroponic berry farm in California … They are pretty and have a nice flavor though not as intense as a local seasonal berry. Nothing a little sprinkle of sugar won’t fix. And, no, I didn’t use the entire spoonful. Just enough to get the berries to release a little juice. 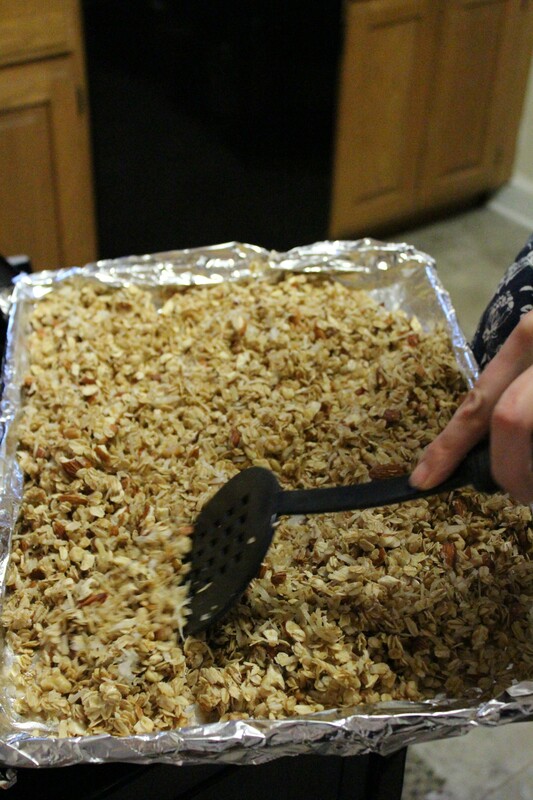 I got this started when the granola was baking so it had about an hour at room temperature. A scoop of vanilla yogurt, a nice bunch of berries, and a handful of granola. Delicious. I almost didn’t post this recipe because it’s just so easy. Ah, but the devil’s in the details and it’s sometimes the easiest recipes that flummox future preparers because the tweaks and substitutions are what get you every time. So, here you go, have at it, and mazel tov! Preheat the oven to 250 degrees F. Line a large baking sheet (or two smaller ones) with foil and spray very lightly with no-stick spray. 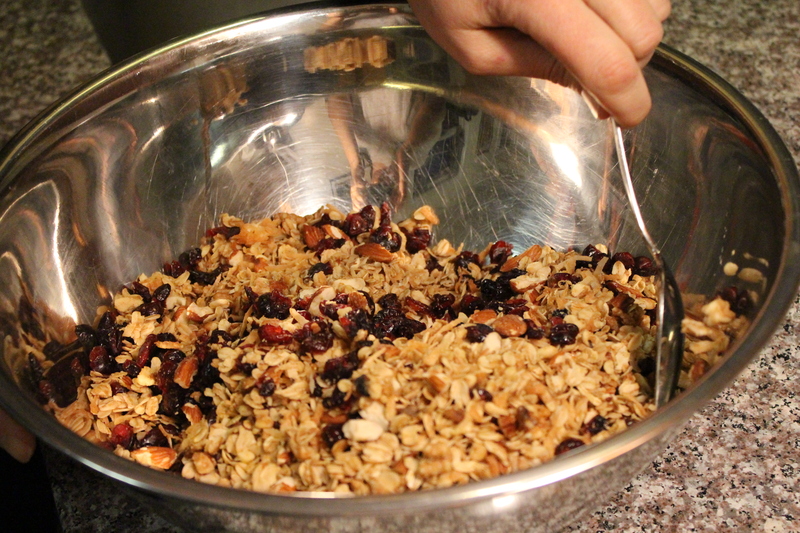 In a large bowl, combine all of the ingredients except the dried cranberries. Toss well to distribute the ingredients evenly. Pour onto the baking sheet(s) and spread in an even layer. Bake for 1 hour 15 minutes, stirring every fifteen to thirty minutes (I often forget this step, remembering only halfway through. Though not ideal, I haven’t noticed a huge difference). 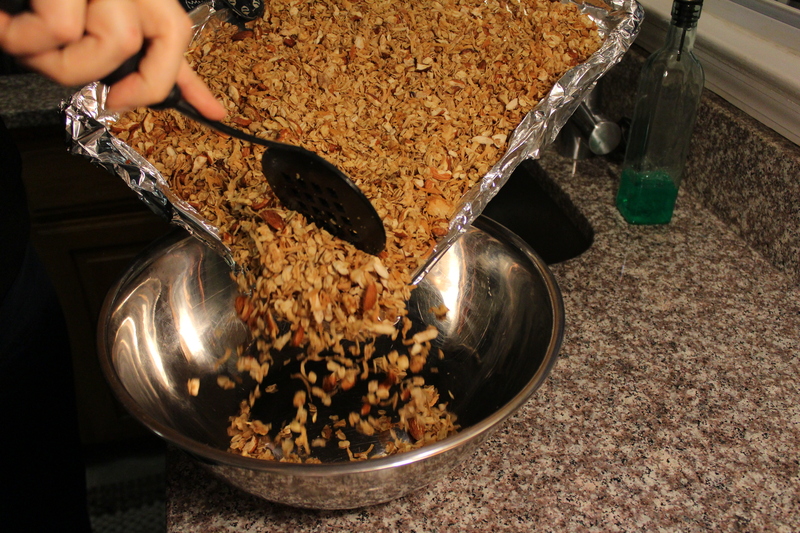 Meanwhile wash the large bowl and when the granola is done baking, put back into the cleaned bowl to cool. Once cooled, add the dried cranberries, toss to combine. 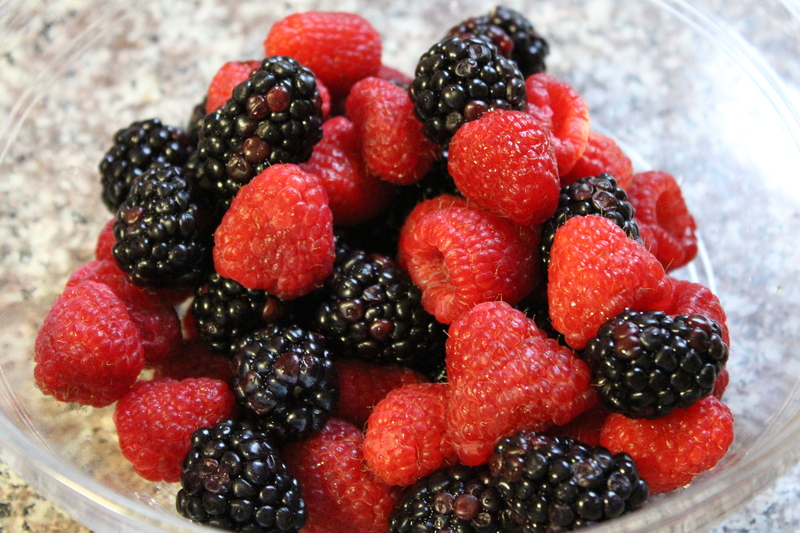 This entry was posted in Breakfast, Desserts, Vetegarian and tagged berries, Breakfast, brunch, delicious, family, fiber, Fruit, healthy, kid friendly, Make-Ahead, nuts, oatmeal, on the go, parfait, Snack, special occasion, vegetarian. Bookmark the permalink.